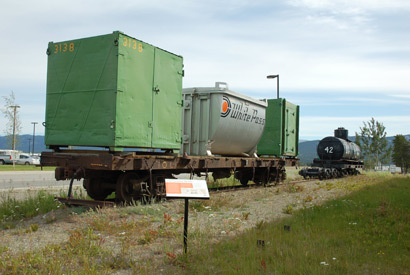 Although now commonplace, shipping goods in large containers was once just the aspiration of a little railway company based in Yukon and Alaska. 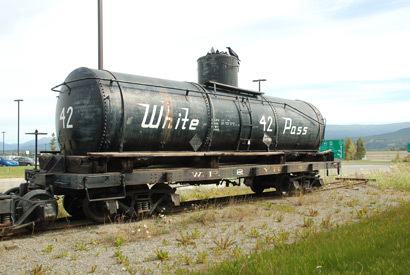 Originally established to service the Klondike Gold Rush of 1898, the White Pass & Yukon Route Railway (WP&YR) linked the port town of Skagway, Alaska to Whitehorse, Yukon. Whitehorse quickly became a company town as WP&YR expanded their ventures into a fully integrated transportation company. 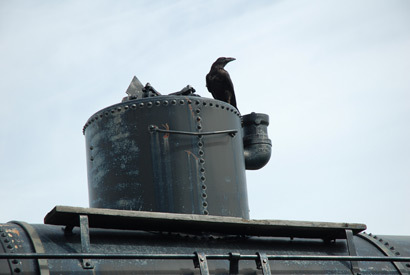 They operated docks, trains, stage coaches, sleighs, buses, sternwheelers, trucks, ships, airplanes, hotels and pipelines — all within their first 50 years of business. Notwithstanding their success, WP&YR continued to expand. In 1954, the company embarked on a modernization program and completed plans for the development of an integrated ship-train-truck system for the movement of containers. This system would streamline their freight business through the easy transfer of containers from train or truck to ship, and vice versa. This system, also known as inter-modal shipping, greatly improved efficiency and revolutionized commercial transport systems worldwide. In fact, it was so successful that it remains the main method of shipping today.